Editor’s Note: As a reminder, we like to keep our reviews of waterfalls short and sweet. We hope you didn’t come here looking for a huge dissertation on why we think one is better than the other or some scientific breakdown complete with water analysis. They are waterfalls. We have never found one we didn’t like. Our goal here is simply to provide you with some photos and to give you our uneducated and subjective thoughts in 5 categories – Ease of Hike, Distance of Hike, Crowds, Options for Exploring, and The View – so that you can make a decision about which of North Georgia’s amazing waterfalls you think might be the best hike for you. We hope these simple rankings and photos help you sort out that out. Enjoy. This is another great waterfall hike that is centrally located to Helen. While Dukes Creek Falls and Raven Cliff Falls back to the west of Helen tend to be the more popular spots, Horse Trough Falls is just as close and half as crowded. Although the trail is usually only open from March to December. From Helen, head north on GA-17/GA-75 towards Hiawassee. Once you pass GA-75A on the left (the place with the tubing and high ropes course), you’ll go about 7.5 miles to Unicoi Gap where Wilks Road on the left. Wilks road isn’t marked but there you should see the sign in the photo above on the left. Once you turn left, go roughly 5 miles down the gravel road at which point you’ll run into the Upper Chattahoochee Campground and the entrance to Horse Trough Falls. The drive down to the campground and falls from the main road is gorgeous pretty much year round. About half way down there are a few huge clearings under the trees on the left. If you like more primitive camping, there are some great spots here right along the creek and you can avoid the crowds down at the campground. Once at the bottom of the gravel road, veer off to the right. Follow the signs and the road all the way to the back of the parking lot, past the campground and picnic areas, and you’ll find the entrance to the waterfalls. We have never camped down in the actual campground – always preferring to stay at the primitive spots further up the road. But they have restrooms down here (no showers; bring your own toilet paper) and 34 camp sites. Most of them have concrete pads, picnic tables, and fire pits. We have never been in peak summer, but in the Fall and Winter, there are usually a dozen other campers but it is never overly crowded. Once you get to the backend of the campground, you’ll see a small trail that leads up to the waterfalls. The hike is a short .25 mile – if that. While the water flowing over the falls is from Horsetrough Creek, the water coming down from the creek on the right and under the footbridge is actually the very first parts of the Chattahoochee River that you can see without taking the Appalachian Trail or bushwhacking through the woods. 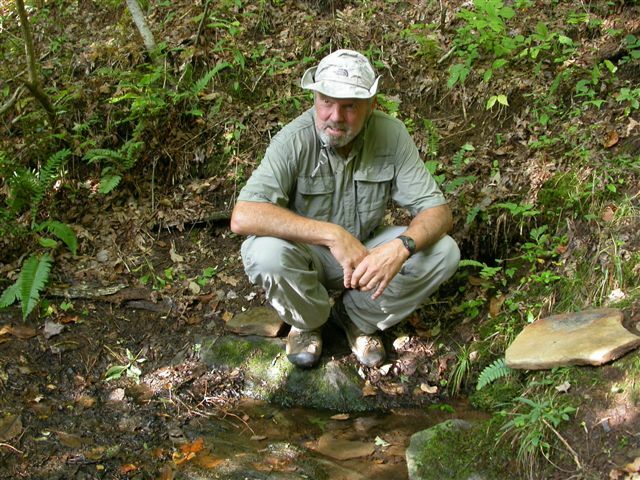 If you followed it up stream less than 5 miles you would be at the humble source of the Chattahoochee River that trickles out of a natural spring right off the Appalachian Trail between Chattahoochee Gap and Red Clay Gap. Hard to believe that it goes from this to this within a few hundred miles. The waterfall itself is nice. As you approach it from the trail after the footbridge, you can see it just barely peaking out from behind the trees. It reminds us most of Minnehaha Falls. It’s tall and steep with two or three ledges. It comes in at 55-feet tall. There is a viewing deck at the base although there are clear foot paths where people have ignored the deck and opted to get right in the falls. Being that it’s such a short and flat walk from the parking lot and has a viewing deck, it is the best all ages waterfall in North Georgia in our opinion. Our favorite spot at Horse Trough Falls is the area off to the right (as you walk up). There is a nice clearing besides the Chattahoochee (waterfall side) that is perfect for hammocking or a picnic blanket. The temperature stays cool here year round and even in the summer, feels great. If you walk far enough in to be away from the other waterfall watchers and bring a book and something to drink, you’ll be set for hours.